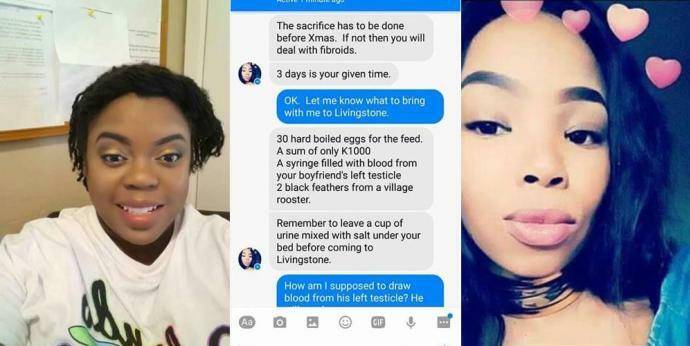 A slay queen who apparently was not too happy with her life and planned to use her baby daddy for rituals has been caught. 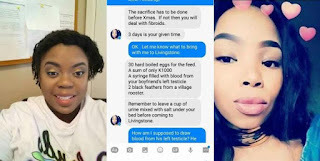 According to the story the couple have been together for over seven years and even have a 3-year-old son, but the lady was not happy and content with the little they had, she planned to draw blood from her boyfriend’s left testicles for the sacrifice. #Repost PLEASE READ & SHARE TO WARN OTHERS ABOUT WICKED SLAY QUEENS. ZAMBIA, BE INFORMED!!!!! Admin please hide my ID. I have been dating this lady named Eunice for 7 years, we even have a 3 year old son together who’s ID is also with held. I have never cheated on this woman neither have I hurt her physically or emotionally. I have always supported her with what ever she wanted I even support her education and take care of our son when she is at work or school. Everything between us was fine until nearly 3 weeks ago when her behaviour towards me changed for the worst. She was always so angry with me and tried to pick fights over petty issues. At first I suspected that she might be pregnant and so the hormonal imbalance in her body is causing all of her terrible mood swings. But I was wrong, she was staying out late at night and buying expensive hair and heels for herself. I grew concerned and asked her where she got the money because i never gave her any money to buy those things and she told me that her cousin from the U.K sent her all the items. I brushed it off and just the day before yesterday I found a plastic full of hospital syringes hidden in one of our kitchen pots. When I asked her, she told me that her aunt in Livingstone was severely sick and so she was taking the syringes to her for medicinal purposes. 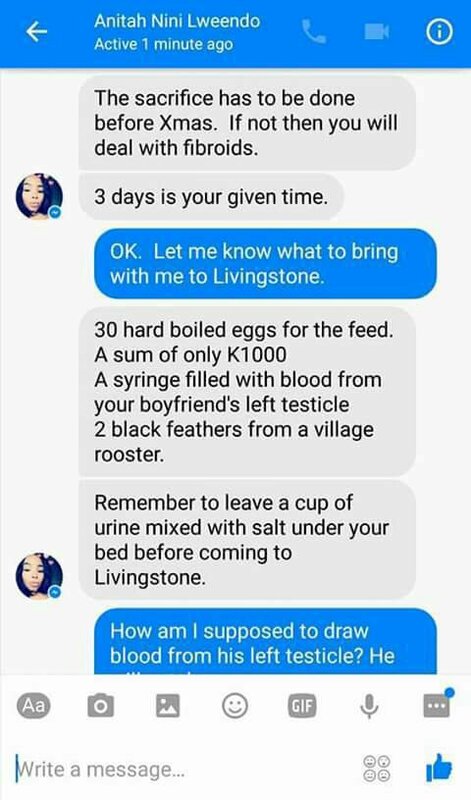 I asked her why her aunt’s family in Livingstone are not taking her to the hospital and why she is the one to travel all the way to livingstone to take care of her sick aunt. All hell was broken loose and she got so angry and shouted at me, she called me ignorant and uncaring for her side of the family. I didn’t say anything and then she suddenly started crying. Yesterday in the morning i was getting ready to go for work when she was in the bathroom taking a bath. I couldn’t find my phone so I decided to use hers to beep my phone. 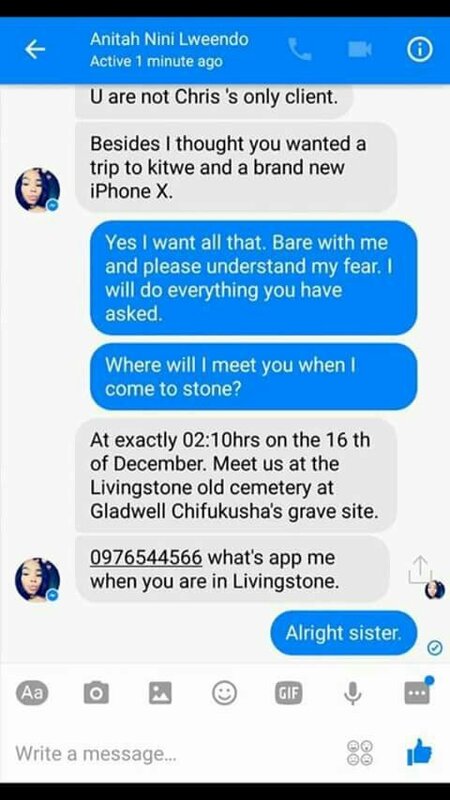 A Facebook message popped up on her screen via Facebook messenger and below are the screen shots of her conversation with a witch satanist who she was going to meet in order to sacrifice me. I am in total shock and disappointment. 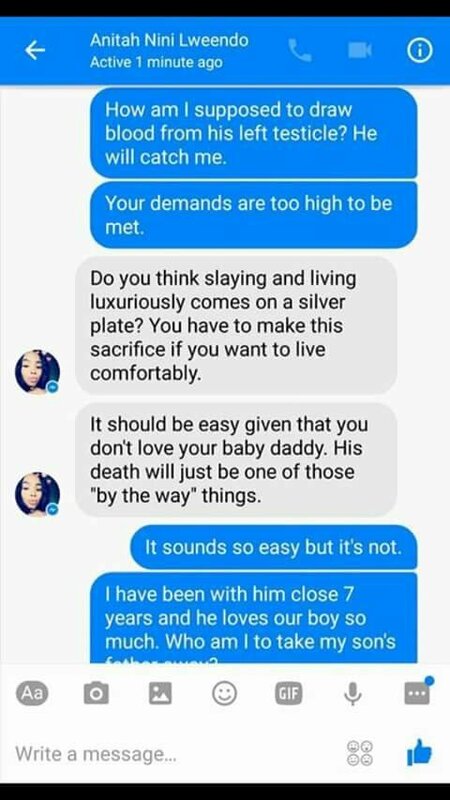 The woman I love and the mother to my 3 year old son was planning my death this whole time. That is when I knew that she was going to use the syringe to draw blood from my manhood. All this so that she can be a slay queen. May God deliver this world. 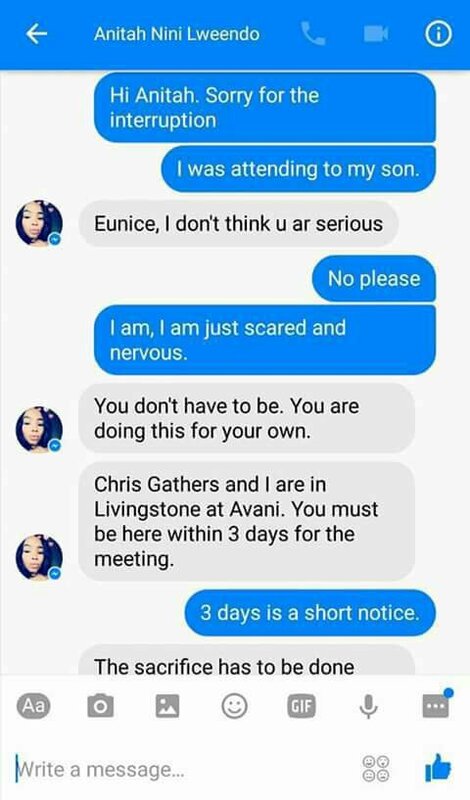 Please admin expose this woman I called my lover and the witch from livingstone she is conspiring with. 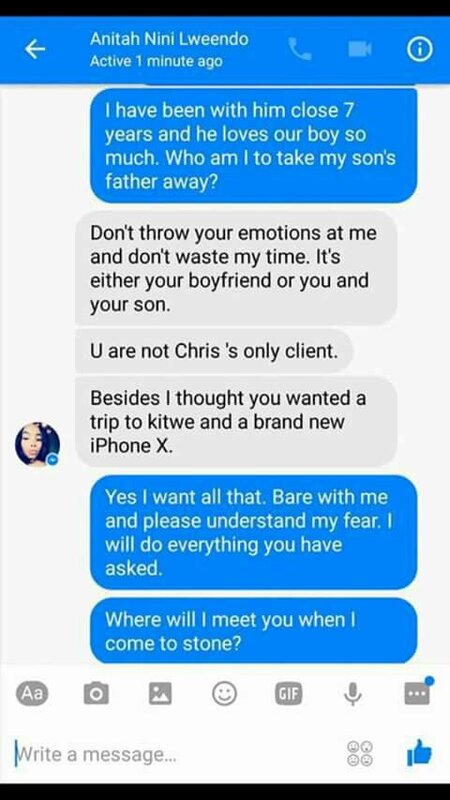 Her names are Anitah lweendo and her satanic partner is some man named Chris.